On first day of New York holiday package upon your arrival in New York a pick up facility will be provided from the airport and you will be dropped at your hotels. After this you are free to explore the city, you can spend the rest of the day going to Time Square, Statue of Liberty or any other sightseeing will be a perfect start of the New York city tour package. Best bus tour will be provided with the flexibility to board up and down from the bus at 40 different locations making you visit all the famous places in the city. Visit will be arranged for Metropolitan Museum of art, Times Square, Brooklyn Bridge and much more. Live-tour guide services will be provided in different languages. In this New York City holiday package Uptown and downtown visits will be arranged for the tourists in the tour buses. Checkouts will be made from the hotels on the 3rd day of the New York weekend trip packages and drop facility will be arranged to the air port. Some of the attractions at New York are the Empire State Building, Ellis Island, the Statue of Liberty on Liberty Island, Central Park, Times Square, Coney Island, museums, sports stadiums, luxury shopping malls and much more. 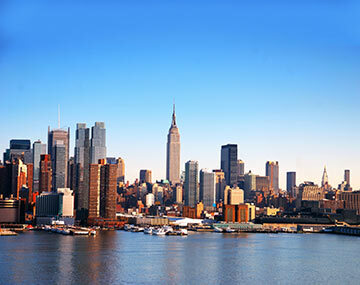 3-Day package to New York city very affordable in terms of cost and moreover it can be planned for weekend too. We have planned everything in our package without any compromise with the comfort and convenience. All the pickup and drop facilities from the airport. Any type of charges incurred by the airlines due to the extra baggage. Any increase in the airfare tickets incurred due to increase in the fuel prices. All the pot rage charges and charges incurred while travelling to the places of your choice. Bus tickets while travelling on Day 2. Any type of the charges levied on the traveler due to optional services taken. Child age Should be 2-9 years. Above 9 years is considered as an adult. Great package organized by Bookotrip. The best part I enjoyed the most was the New York city tour in bus.